Happy Sunday, friends, and happy Easter to those of you who are celebrating. It was a long and busy week here, but the weekend has brought a lot of happiness–namely, Steven’s and my two year anniversary yesterday. It’s hard to believe that it’s been two years since we met, both in such different places in our lives and living in DC. One move, two grad school programs, one career shift, and four semesters later, we’re still relishing the experience of living together and learning from each other. It has been one of the most important relationships, partnerships, and friendships of my life, and I feel lucky to watch it grow. So, lots of gratitude this morning. And here are the reads and recipes that have caught my eye. Easter brunch includes dessert, right? 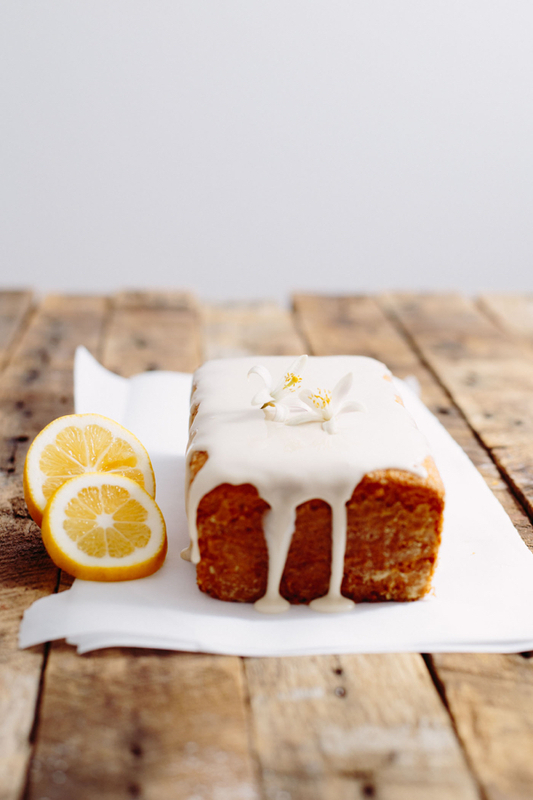 This vegan lemon poundcake from Raquel of My California Roots looks totally authentic, and absolutely delectable. 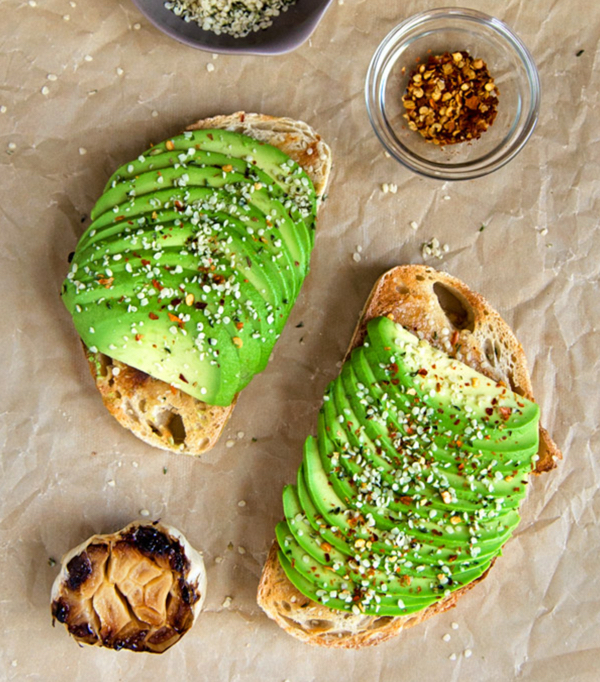 A simple-yet-game-changing spin on avocado toast: give the bread a good rub with sweet, tender roasted garlic (and then top with hemp seeds and crushed red pepper). Thanks for the idea, Meg! 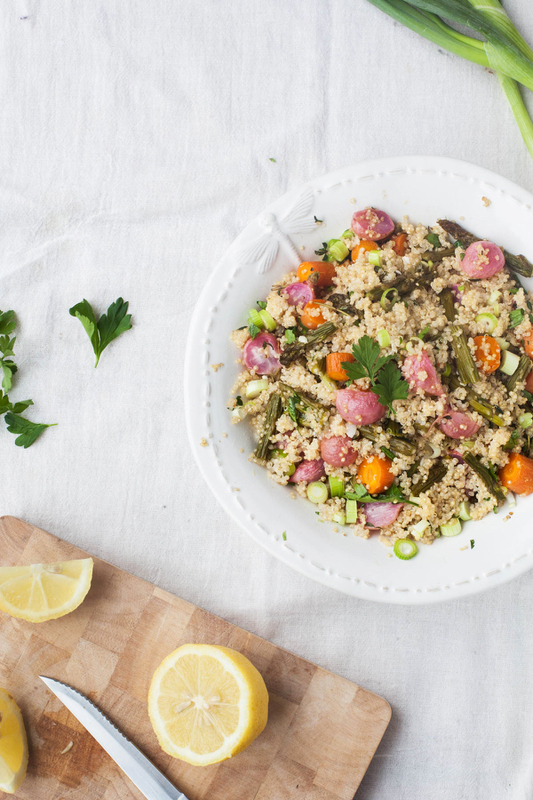 Spring is in the air, and Aimee’s colorful roast spring vegetables with lemon herb quinoa is a perfect way to celebrate. Simple, bright, and healthy! 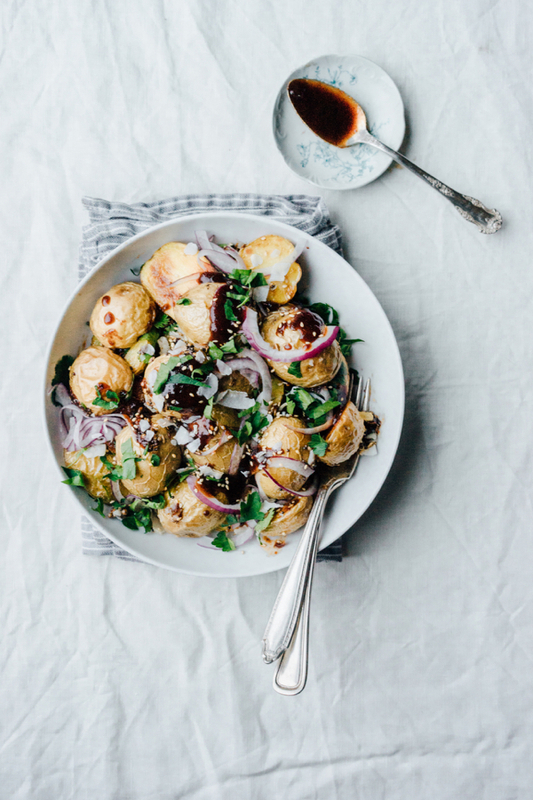 Pick up a back of baby potatoes and create a comfort food side dish with a spicy twist: Sasha’s masala potatoes with tamarind sauce. 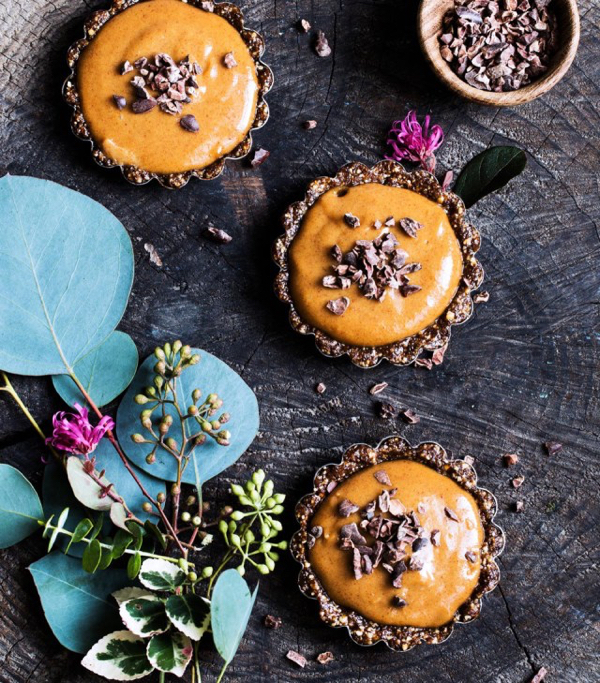 Maya’s easy mini caramel tarts are a perfect embodiment of how simple, nourishing, and beautiful raw food desserts can be. I can’t wait to try them. 1. Doing the SNAP challenge a few weeks ago made me much more conscious of food waste. Before the challenge, I thought that freezing leftovers and not over-shopping basically exempted me of culpability when it comes to waste, but the truth is that I throw out a lot of vegetable scraps, and I’m not always very creative about how I use up my odds and ends. Oh totally. In my book I have this anecdote about ordering a sandwich in a coffee shop while writing. It came as a salad, drenched in this dressing I was not into. I was not eating that. The irony wasn’t lost on me: I was writing Waste-Free Kitchen Handbook, knowing that this salad is going to get tossed. It’s not an all-or-nothing proposition. The less food you waste, the less demand signal you’re sending through the chain; the less food that gets grown unnecessarily, the less that gets thrown out. I’d hate for people to be such perfectionists that they don’t try in the first place. I think this quotation speaks perfectly to the issue of food waste, but it’s also a good way of framing most dietary changes or efforts. Perfectionism–and its tendency to breed easy discouragement–is often the true enemy, whereas small efforts to do better whenever and however we can really do bring about change. This is a powerful way of regarding patient care, one that takes into account not only what is medically advisable, but also what a patient wants. I know that it is the duty of medical professionals to suggest and administer life-saving treatments, and I know that sometimes a doctor’s recommendation comes crashing up against a patient’s own wishes. There’s nothing easy or straightforward about such a scenario. But I believe that there must be a way for physicians to incorporate a patient’s goals into determining a course of treatment–especially as compliance is a huge part of any treatment’s success. 3. I’ve written recently about the health benefits of spicy foods, but I continue to be so interested in the research findings! This Today Show roundup summarizes the major points, such as longevity and pain relief. And as you can see above, it also features an image of the lovely Anya’s spicy strawberry gazpacho. 4. I was touched by this list of advice from women in their 40s to women in their 30s, and I share it with the qualification that I don’t think it’s confined to either decade. Some of the pieces of advice, such as “love and accept yourself fully” are kind of predictable. But others (“travel more,” “worry less,” “‘no’ is a complete sentence”) really struck me, and they aligned with a lot of the efforts I’m making in my own life these days to be more authentic and assertive, to find my own voice. 5. I was pleased to read this article in the Washington Post about middle schools incorporating mindful eating techniques into their curricula/cultures. The campaign to teach mindful eating skills is intended to help prevent eating disorders of all kinds, including (but not limited to) anorexia, bulimia, and binge eating disorder. Another nutritional counselor who is employed at a boarding school suggests that students “eat without judgment.” She encourages them to refrain from negative body talk and avoid measuring their self-esteem based on the foods they choose to eat. 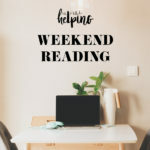 “This is important,” the article states, “since many of these teenagers struggle with the social and emotional changes of adolescence, including body image dissatisfaction. This stood out to be because it’s similar to advice I give to clients who are expressing guilt or dismay over foods that they perceive to have been overly indulgent: focusing on the sensory experience of an enjoyable food can both help to allay anxiety and also frame that food in a meaningful way. The mindfulness it engenders can be carried forward and help to encourage conscious, considered choices. There’s no neat cause and effect when it comes to eating disorders, and while culture plays a big role, genetics, family dynamics, and personal history are also critical. There’s no way for us to create a truly preventive environment, but there’s also no reason for us not to do everything we possibly can to encourage language and mealtime practices that encourage body respect. I’m glad that more and more schools are trying. On this hopeful note, I wish you a lovely, relaxing Sunday. I’ll see you tomorrow with the week’s menu plan! As I prepare for my follow-up GI appointment tomorrow, the thing I’m MOST afraid of is that my doc won’t be willing to partner with me. I want to be a VERY active participant, not a passive receiver. I have questions for her on about every one of these commandments, and am really hoping that her osteopathic training means she’s a bit more open to exploring ALL the options, and not just high toxicity meds. The article on mindful eating made me cry. My gut troubles have been a PITA and omg how I miss my regular diet (also: starting no added sugars on the week you’re PMSing is not a good idea) but…it’s also forced me to tune into my body’s hunger signals in a way I’ve been able to before. After all, the consequence is a whole host of uncomfortable symptoms! It’s definitely been an interesting adventure…and fascinating to connect the pieces of my food preferences, eating disorder, and gut stuff. I only wish we all had this mindful eating training! I look forward to your Weekend Reading posts. Love them! Happy Easter to you. Beautiful round-up, as usual Gena. And congratulations on the two year anniversary. When you find the right person, time seems to fly. When I think of food waste, I think of unused celery that becomes soft and gets tossed (the most common problem in my own fridge), but I’ve never thought about the waste that occurs in the production of food- as she mentions in the interview, with Greek yogurt or other products. Food waste makes me crazy and while I’m a huge meal planner and food prep-er, I’ve begun to not plan for Sunday nights and instead using up whatever is remaining in the fridge. Not only does this reduce food waste for us, but it also forces me to be creative in the kitchen. I think the point that the advice for women in their 30s is relEvanton to every age is perfect. If we haven’t learnt to love ourselves then we should do this as soon as possible – it would waste so many lives from being wasted!